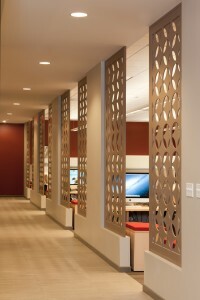 Alternative Workplace Strategies provide non-traditional spaces for work and collaboration. Project: Navis. Photo: Michael O’Callahan. When people use the term “alternative workplace strategies,” or AWS, they’re usually referring to the confluence of office design, mobile technology, and HR policies that enables work to be done from a variety of settings outside the traditional cubicle. It’s a huge umbrella incorporating many different elements, but they all stem from the human behavioral aspect. How we work, how simple we want things, how convenient we want things, and how we just naturally function—from an ergonomic standpoint, a communication standpoint, to how we think and process, execute or implement. AWS has been around for two decades. At this point, it’s not even that “alternative”—it’s almost the norm. According to commercial real estate services firm Jones Lang LaSalle, within two years nearly every major company in the world will have adopted some form of workplace strategy. The implementation of these strategies, however, has not always reflected the needs of the stakeholders, instead being based on what’s trendy. This has led to the recent backlash against open offices. It was trendy, it was cool, everyone was doing it—whether or not it fit the company culture. It was a natural reaction against the Dilbert workplace of “walls up, heads down,” but often didn’t take into consideration the need for separating out tasks that require concentration or privacy. Now, there is recognition that every work organization is different. What’s trendy may not be right for every firm, every industry. What works for tech firms may not work for law firms, and what works for law firm A may not work for law firm B. Instead of prescribing broad-brush solutions, today’s workplace strategy relies on really getting to know each client, understanding their management style and what drives the company culture. You can’t rely on typologies anymore. There’s no such thing as the typical law firm, the typical tech firm. There used to be a point where we would design a law firm, and after asking maybe six or seven questions we’d be able to form a fairly straightforward space plan. You had the big showoff boardroom, the beautiful break room for the guests and clients, the paralegal cubicles, the partner offices. That’s no longer enough. 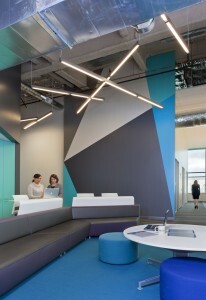 For example, RMW recently designed new Sacramento offices for commercial real estate firm Cushman & Wakefield. When the time came for C&W to evaluate their office needs, Ron Thomas, Executive Director of C&W’s Sacramento operations, realized a change was in order to bring their space more in line with the evolving company culture. Like many firms that provide commercial real estate services, C&W was built on the paradigm of every broker in a private office. In fact, however, the brokerage business has become more and more highly collaborative. Together, Ron and the RMW architecture & interiors design team established a design direction that celebrates the team structure and provides a transparent environment for collaboration, integrity, and mentorship. Benching can be beautiful: Cushman & Wakefield, Sacramento. Photo: Michael O’Callahan. What RMW delivered is far from conventional. There are no private offices. All of C&W’s brokers now collaborate in a single large open day-lit office and are plugged into a furniture benching system with low panels. Everyone works in an open area in modern and efficient benching desks. A willingness to give up some personal space gained C&W amenity space. These spaces provide a variety of casual and formal settings that support work tasks, including a café, an informal lounge, huddle space with lots of technology, and acoustically enclosed conference rooms with glass walls. RMW’s design for C&W wasn’t imposed from the top-down, but grew organically out of an understanding of the work culture. This kind of understanding goes beyond an operational knowledge of what, when, and where people work. It involves an exploration of the more intangible workplace experience, or “presence,” which has become an invaluable part of workplace strategy. Why is creating a “presence” so important? According to studies, a large percentage of corporate work space is empty during work hours. At the same time, the majority of workers say the office is still the best place to interact with colleagues, and that it provides access to needed tools and technology. As employees spend less traditional time at the office, and less time at their desks, the time they do spend is more intense and collaborative. To inspire employee engagement, then, it is vital that the office environment as a whole creates an immersive and coherent community, culture, and corporate identity. 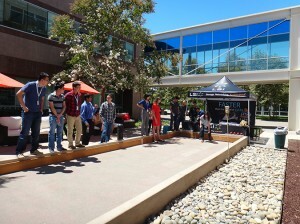 Bocce ball on the LSI campus. Image courtesy LSI’s blog (http://blog.lsi.com/). In Silicon Valley office space right now, one component that’s surged in popularity is the bocce ball court. We’ve put one into our last three projects, and we just ripped out some parking on one of our new campuses to put the bocce ball court in. Bocce ball has been on such a roll (pun intended) because it’s an easy way to create an immediate experience. It brings people together. It costs nothing once the infrastructure’s in place. It’s year-round, and it’s simple to play. Just tossing a bocce ball court onto your campus is no guarantee of creative interaction, of course. The role of the workplace strategist is to align design elements to support social connection, define an organization, and inspire employee engagement. A cohesive office environment—whether it includes bocce ball, brainstorming rooms, or bean bag chairs—becomes more important than ever as Alternative Workplace Strategy, with all of its various elements, goes mainstream.